Today is International Women's Day | Take Back Halloween! Every year on International Women’s Day, potted histories appear online to explain why March 8 is the day we honor women. Many of them are wrong. Back in the 1980s historian Renée Coté undertook a meticulous search of the records, trying to figure out the origins of the March 8 date (see “International woman’s day: in search of the lost memory”). There were a number of women-led strikes and marches and protests in the years leading up to 1914, but none of them happened on March 8. In 1914 a Women’s Day observance was scheduled for March 8—probably because that was a Sunday and thus convenient for working women—and that’s the date that stuck. The German poster at right advertised the event. 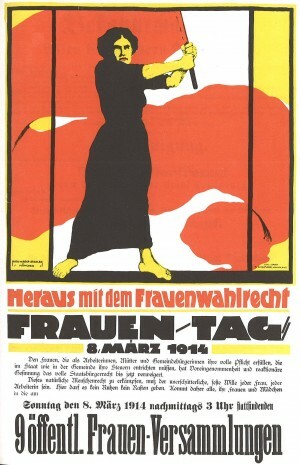 Three years later, on March 8, 1917, International Women’s Day achieved world-shaking significance. On that date (which was February 23 in Russia, where they were still using the old Julian calendar), women in Saint Petersburg went on strike for “Bread and Peace.” They were demanding not only the vote but an end to the war and the food shortages that were crippling the nation. Their protest evolved into the first Russian Revolution. Here in the United States, March 8 never really caught on as a big popular observance. (The fact that it was a major Soviet holiday may have played a tiny role there.) But it is the reason National Women’s History Month, which was established by Congress in 1987, is in March. Over on our Facebook page we’re celebrating all month with “this day in history” updates.